Hydroforming was developed in the late 1940’s and early 1950’s. It provides a cost-effective method to produce relatively small quantities of formed parts, parts with asymmetrical or irregular contours, and parts with shapes that do not stamp well on traditional presses. Any metal capable of cold forming can be hydroformed. These include aluminum, brass, carbon and stainless steel, copper, and high-strength alloys such as titanium. In the top half of a hydroform press there is a pressurized forming chamber filled with oil, a rubber diaphragm holding the oil, and a wear pad. The die element (like a mold) is called a punch, and resides inside the base of the press, beneath a bed, or ring. The punch is attached to a hydraulic piston which raises it with extreme, controlled power. Sheet metal, cut to shape, is called a blank. The process begins by placing a metal blank on the ring. The press is then closed bringing the upper chamber of oil down on top of the blank. The oil in the forming chamber is pressurized while the punch is slowly raised through the ring, pressing the blank into the oil-filled forming chamber. Because the upper portion of this forming method is a rubber diaphragm, not a female die, hydroforming will create the shape without scratching the surface. The diaphragm supports the entire surface of the blank as the punch rises into it, and the blank takes on the shape of the punch. 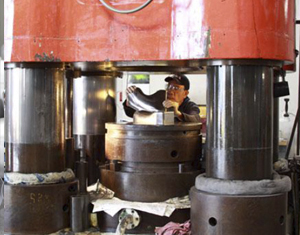 When the cycle is complete, the pressure in the forming chamber is released, the top of the press is raised, and the finished part is removed from the punch. Tooling – With low volume runs, tooling is often the most costly. With hydroforming, the male die, or punch, and a blank holding ring are the only tools required. The rubber diaphragm and pressurized forming chamber act as a female die. As a result, hydroforming tooling is typically 50% less expensive than matched-die tooling. Punches are made from less expensive metals than the hardened tool steels used for match die punches. Plus, hydroforming punches are easily mounted and aligned, making set-ups fast and efficient. Development Costs – When Proto-typing, changes in material types or wall thickness specifications can be made without creating new tooling. Reduced Press Time – Complex parts requiring multiple press cycles in male/female die operations can be incorporated into a single hydroforming cycle. Hydroforming presses frequently require 60-70% less time compared to conventional matched die presses. Finishing Costs – Unlike matched die metal forming, which can leave scratches and stretch lines, the flexible diaphragm utilized in hydroforming eliminates surface blemishes and only leaves outstanding surface finishes. This reduces the need for costly outside finishing processes such as buffing.